Scotty Cameron prototype putters were shown to players for the first time in Hawaii. For years, Scotty Cameron has used the early portion of the PGA Tour season to give players an early look at prototypes that eventually turn into retail putter models. Beginning last week at the Sony Open, Cameron rolled out three prototypes: T-8, T-8.5 and T-12. Adam Scott was one of four players in the field who gave the putter a chance at Wailea. For players who didn't make the trek to Hawaii, the Desert Classic in La Quinta, Calif., acted as the first official Tour event on the mainland for the putters, which feature a new aircraft aluminum design that extends all the way back, as opposed to ending in the inlay. In the past, the inlay has been added to give the putter a distinct feel and feedback at impact. "I think the biggest feedback we've received so far has been how good the putter feels at impact," said Scotty Cameron Tour rep Johnny DelPrete. "We're still in the early stages, but that's definitely something that keeps coming up when guys test." Scotty Cameron T-8 and T-8.5 prototype mallets. A variety of sight line options were also available on the practice putting green, including one with three yellow dots and two long lines for alignment purposes. The T-8 and T-8.5 models appear to have the same shape but a slightly different bend in the shaft, with the low bend offering more toe hang and the mid-bend a face-balance look. The sharp edges on the head — near the face and back — work in tandem with the alignment aides to improve aim. The T-12 has a more futuristic look with triangular weights attached to the back of the head, along the perimeter, to increase moment of inertia. The silver finish on the perimeter of the head contrasts with the black aluminum and seems to add another level of alignment. 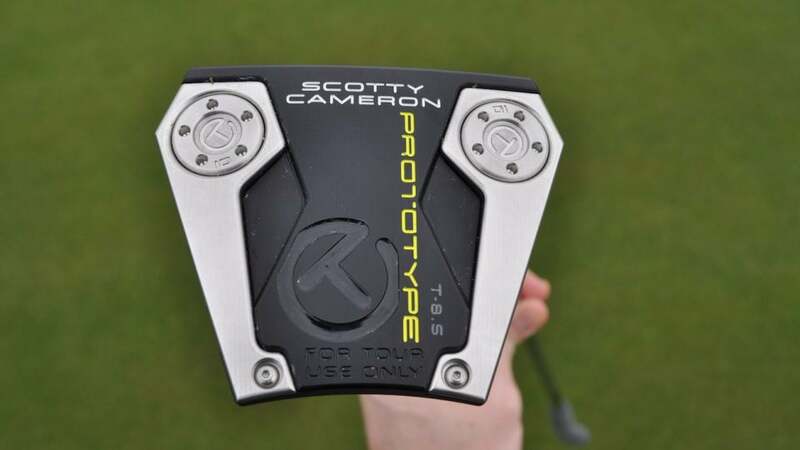 Judging by the yearly release of Cameron's prototypes on Tour, it's likely we'll see a retail version introduced shortly thereafter at the PGA Merchandise Show in Orlando. The Scotty Cameron T-12 prototype mallet.